Возможности Has exposure compensation function (range/steps unspecified). Can function as a tethered USB webcam for video conferencing. Voice annotation feature allows 30 seconds audio per image. Compatible with 3.3v SmartMedia cards from 4 to 128MB. Complies with USB 1.1. Playback zoom is up to 10x at 1600x1200, 8x at 1280x960 or 4x at 640x480 pixels. 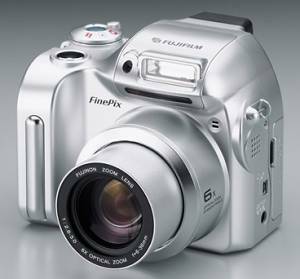 Comes bundled with 16MB SmartMedia card, 4 x AA Alkaline batteries, shoulder strap, USB and video cables, FinePix Viewer, USB driver, DP Editor and Adobe PhotoDeluxe 4.0. Optional accessories include AC-5V power adapter.